Do you remember what we talked about in the Article Thermal Control in Space? In this article we made a general introduction to thermal control, applied not only in space but in several fields. However, now we go a little step forward by describing the main heat sources that affect a spacecraft during its mission in the solar system. External heat sources are those that come from outside the considered system. In this case, we define the spacecraft as our system, so external sources are those caused by the environment. As you may know, neither conduction or convection take place in space. Conduction only happens within the spacecraft, as there is little matter in deep space, so no energy can be transferred through matter. Regarding convection, a flow is necessary for it to happen, which is not the case in deep space. Finally, only radiation remains, which is heat moving as energy waves. Hence, it is the only way to transfer heat in space. There are three main types of radiation: direct solar, albedo and planetary flux. However, other significant forms of environmental heating are, for instance, free molecular heating and charged-particle heating. Is it not clear? Let`s explore them in more detail. The Sun is the main energy source in the Solar System. As it is very hot, it emits a lot of radiation. Hence, it is directly responsible of the direct solar radiation and indirectly responsible for albedo. However, some questions arise: is it a constant effect, or does it depend on some parameters? As you may have guessed, intensity values through the Solar System depend on the distance from the Sun. Right! Different bodies receive light of an intensity inversely proportional to the square distance from this star, which is a conclusion of conservation of energy. 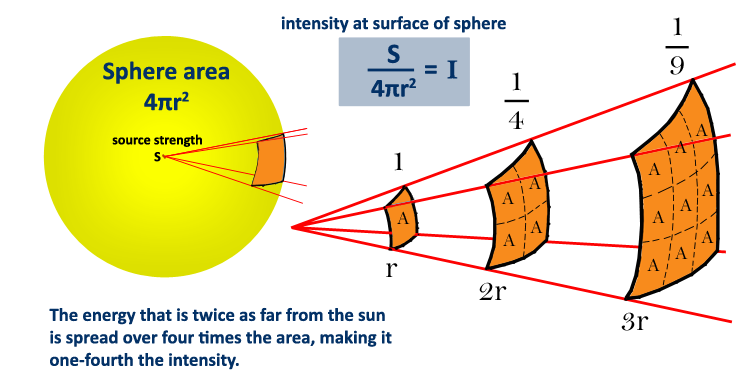 Moreover, you need to know that a very important parameter is the solar constant, defined as the intensity of sunlight at Earth’s mean distance from the Sun (1AU). Despite the fact that the Sun has activity cycles of 11 years duration the direct solar radiation is very stable, remaining almost constant. However, as the sunlight intensity varies with the distance from the Sun, the solar flux is maximum at the passage of the perihelion and minimum at the passage of the aphelion. This is caused by the elliptical orbit of our planet around the Sun. Nowadays, the intensity of sunlight has a maximum at winter solstice (1414 W/m2) while in summer solstice it presents a minimum (1322 W/m2) (See Figure below). Do you remember what happens in summer when we use black clothes? Much better to use white clothes right? No doubts about that. Albedo of planetary bodies refers to the same concept: how moons, planets or asteroids surfaces reflect sunlight from the Sun. Hence it is defined as the ratio between radiation reflected to total incident radiation. Zero stands for no reflection at all, (our black clothes) while one would be a white surface. Albedo is highly variable, depending on several factors such as the type of surface (continental regions or oceanic regions, ice, snow..) or the weather (clouds). 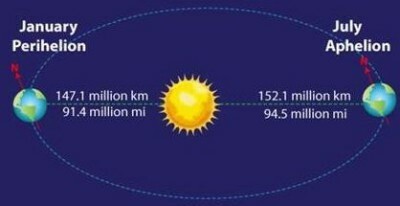 For instance, if the orbit of the spacecraft goes over the terminator (the terminator is the moving line that separates the illuminated day side and the dark night side of a planetary body), the albedo heat load will approach zero, no matter what value of reflectivity it has, due to the fact that no reflection will take place (sunlight beams will be parallel to the planet surface). However, in the subsolar point, where the surface is perpendicular to the Sun’s rays, the heat load will be maximum. This phenomenon is shown in the Figure placed below. Do you imagine a hot ball? All bodies at a temperature greater than 0K emit heat radiation. In the Solar System, the Sun is the primary source of energy, and it is responsible of the incident sunlight that heats the Earth. Hence, our planet will also become a heated ball and this heat will be emitted as radiation. This is the basic idea behind planetary radiation. At the beginning of this article I said: ”No convection in space!”. And it is true, but I would like to make some comments about a form of convection that may affect spacecraft in the outer part of the atmosphere. This type of environmental heating is caused by the bombardment of the spacecraft by individual molecules. This is the reason why this phenomenon only occurs when the spacecraft is placed in the outer part of the atmosphere, at the end of the launching phase, after the booster’s payload fairing is ejected or during reentry. All incident sunlight not reflected as albedo is absorbed by the moon or planet radiated by the Sun’s rays. Moreover, other aspects as the internal energy generated by the planet contribute to increase its total amount of energy. Eventually, this energy, known as planetary radiation or longwave radiation, is returned to space emitted by the planet. It is characterized by its variability, so its value changes a lot due to several factors, such as local temperature of the planet’s surface or the cloud cover. 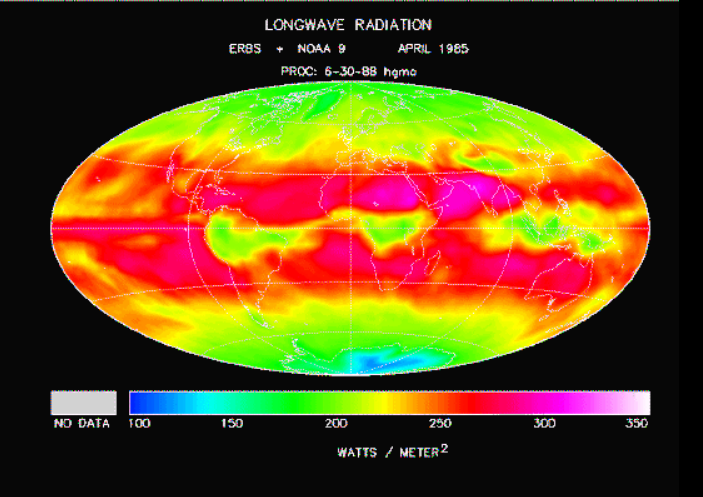 For instance, desert and tropical regions emit more longwave radiation than the colder ones. Meanwhile, radiation decreases with latitude, as it can be observed in the figure. In space there are two types of radiation: ionizing and non-ionizing radiation. The first one has enough energy to remove electrons from the orbits of atoms resulting in charged particles. The interaction with these charged particles heats up the spacecraft. In other words, the interaction with charged particles that are caused by ionizing radiation causes the spacecraft to heat up. Nevertheless, it is weaker than the previous heating sources being significant just in cryogenic temperatures where sensitive systems may be affected by these heat loads. For example, in the Van Allen belts regions there are several trapped charged particles, which can modify the temperature of the satellite. The last point is internal sources, which are related to the heat generated inside the spacecraft during its operation. As neither convection nor conduction take place in space, the heat generated by electronic components, batteries and other elements has a great impact on the spacecraft’s temperatures. This is because heat cannot be dissipated so easily as just radiation plays a major role in space. Hence, different devices are used to evacuate this heat. After this article introducing heat sources in space, we will talk about different strategies used to manage temperatures, so be patient and stay in touch! IDEAS (Innovative Datasets for Environmental Analysis by Students). Solar Intensity. [Online]. 2015. url: http://www.geog.ucsb.edu/ideas/Insolation.html#intensity (visited on 12/03/2016). North and South poles. Important climate differences. [Online]. 2015. url: https://wattsupwiththat.com/2015/02/13/north-and-south-poles-important-climate-differences/ (visited on 25/04/2016). Exploring Biomes. Insolation and Angle of Incidence. [Online]. 2015. url: https://akbiomes.wordpress.com/2015/01/08/insolation-and-angle-of-incidence/ (visited on 12/03/2016). Wikipedia. Black-body radiation. [Online]. 2015. url: https://en.wikipedia.org/wiki/Black-body_radiation (visited on 12/03/2016). José Meseguer and Isabel Pérez-Grande and Ángel Sanz-Andrés, Spacecraft Thermal Control. NASA, What is space radiation? http://srag-nt.jsc.nasa.gov/spaceradiation/what/what.cfm (visited on 25/03/2016).